Whenever there’s a terrorist-y attack on our electrical or internet infrastructure, the first thing I think of is “squirrel!” while others are quick to point the finger at China or Russia, your smart money will always go with squirrels. Well, there’s everything, and then there are squirrels. I’ve witnessed the results of a squirrel vs. power lines. Back in 2010, one of our rowdy neighborhood squirrels gnawed through some insulation and what would be known as Electro-Squirrel was born (or died, depending on your point of view, or the squirrel’s). Electro-Squirrel became shockingly still and remained that way for six months, until it was finally freed by a merciful storm, ending its reign of terror as a daily reminder of my own wobbly mortality. Small compared to what? 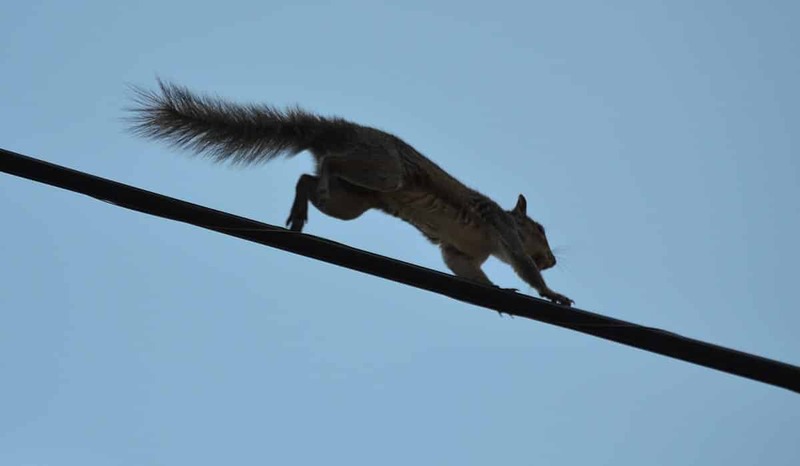 Squirrels have already outpaced human terrorists in creating havoc with the nation’s electrical system. There are websites that track squirrels’ havoc, like Cyber Squirrel 1, which features a map pinpointing places in the world where squirrels have succeeded in causing power outages. There’s a Wikipedia entry for “Electrical disruptions caused by squirrels,” where you’ll find that there’s an acronym for it: POCBS: Power Outages Caused By Squirrels. The American Public Power Association is perhaps the nation’s No. 1 watchdog when it comes to POCBS. It maintains a data tracker called (why not?) “The Squirrel Index” that follows trends in squirrel-caused electrical calamities. The association reports that In 2016 alone, utilities reported 3,456 outages caused by squirrels that cut off power to more than 193,873 customers. North Korean hackers drool at such numbers. Squirrels can hop past plastic animal guards, squeeze through impossibly small place spaces and, most importantly, in terms of geographical coverage, they’ve caused outages in all 50 states, including Hawaii, which claims to not even have squirrels, which is scary because that means they can do damage even where they don’t exist. Although those might be mongooses, so you can add those creatures to the menagerie that has caused outages (although they’ve all been far outdone by squirrels): Raccoons, birds, snakes, cows and caterpillars. Did you have a question about caterpillars? In 1975, thousand of them hatched in oak trees (again with the oak trees) in Liberty, Texas, and crawled all over power lines causing outages throughout Southeast Texas. Just a little something else to worry about.